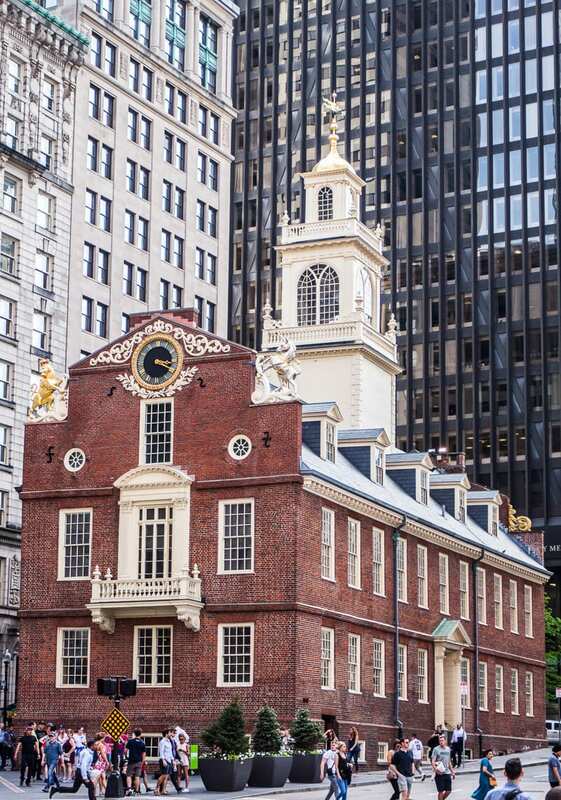 There is an incredible amount of interesting, historical, and fun things to do in Boston MA. This is a city that combines the flavor of some of my most loved cities in the world. As we wandered around certain areas I had a feeling like I was back in London, or maybe Dublin, and at times even Sydney. And then gluing together the charm of these three cities is the American spirit. All my favorite places in the world for charm, sophistication and a little mix of fun and debauchery. That’s why Boston Massachusetts has probably scooted in as my favorite city in the USA. This small walkable city, absent of notable high rises, is full of historical charm and beauty. It wasn’t until walking around here and feeling so free and spacious despite all the crowds made me realize how constrictive and restrictive NYC can be. I do love those Manhattan high rises but it does bring an intensity that can sometimes wear you down. In Boston the people are friendly, have a great sense of humor, they have a strong sporting culture (all four pro sports teams) and seem to love fun and acceptance. We soon learned the way they pronounce their words – skipping the pronouncing of the letter r – means they sound really Aussie! Finally a bartender who can understand me when I ask for a beer or where I can park my car. There are so many things to do in Boston; we barely scratched the surface after our three day trip to Boston. We’ll definitely be back, probably more than one time. Need More Tips for New England? 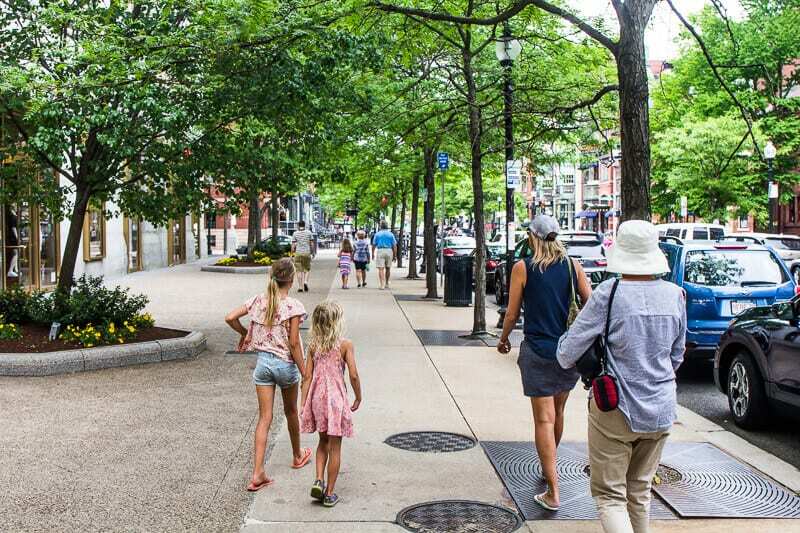 The Freedom Trail Guided Walking tour is definitely one of the best things to do in Boston, especially with kids. We laughed the whole way through it at our guide’s dry sense of humor and his funny way of telling the truth about the history of Boston. There’s no better way to learn and remember history than through entertaining stories whilst you stand in front of the historic sites where the stories happened. We only did the short tour which takes in half of the Freedom Trail. 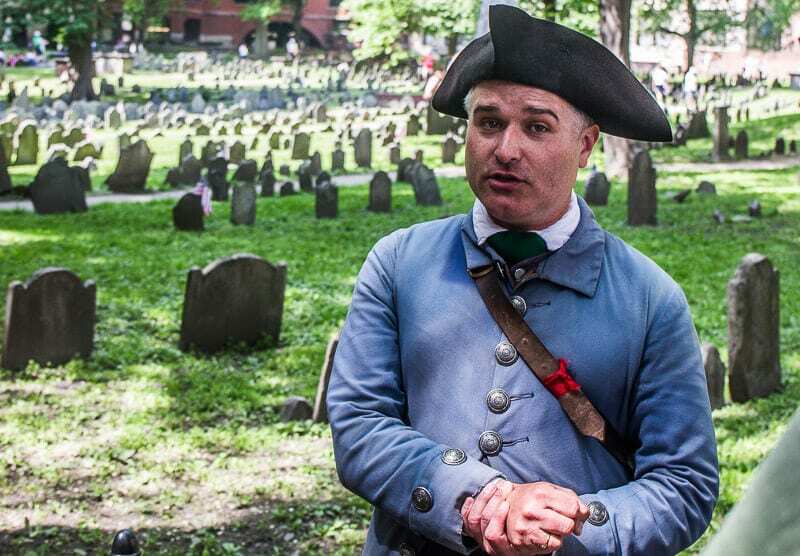 The Freedom Trail stretches 2.5 miles from Boston Commons to Bunker Hill. I’d love to do the second half that ends in Bunker Hill. Ours stopped at Faneuil Hall. 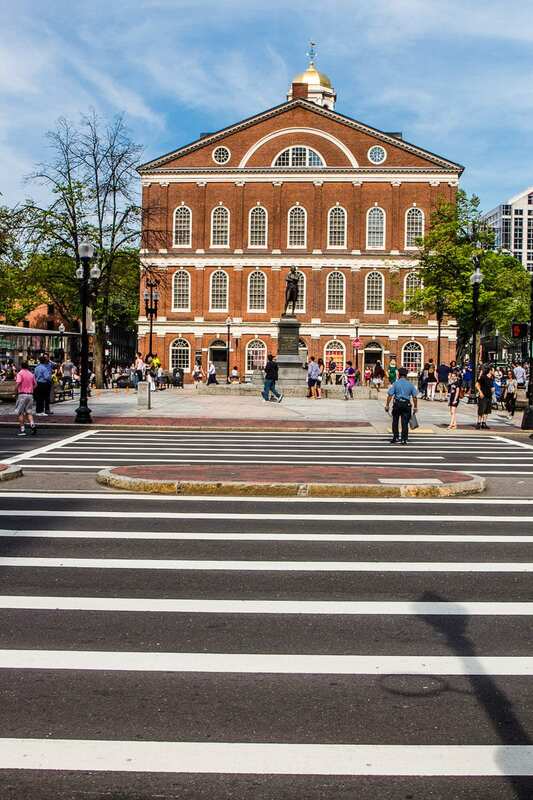 You can take a self guided tour of the Freedom Trail. But I’d recommend taking the guided tour though as you gain so much more from the stories and knowledge of the guides, who are friendly and happy to answer your questions. 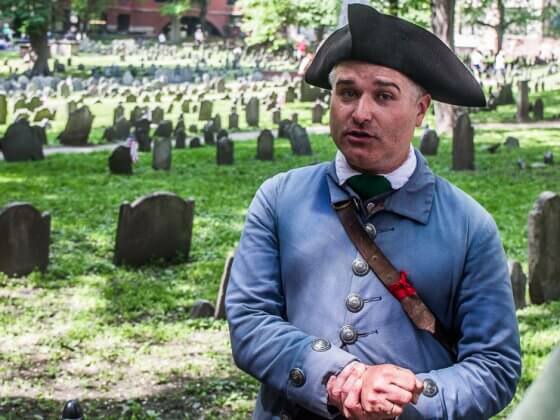 Book your freedom trail walking tour. Don’t forget the Boston Go Card which includes this tour. This was seriously the best afternoon break experiences I have had in a long time. It was the prefect elixir after a long day of driving and walking to explore the historical North End area of Boston. We immediately fell in love with its cobblestone streets and narrow alleyways. A wander down the main street brings an aroma of coffee, pizza, and good Italian pastries. 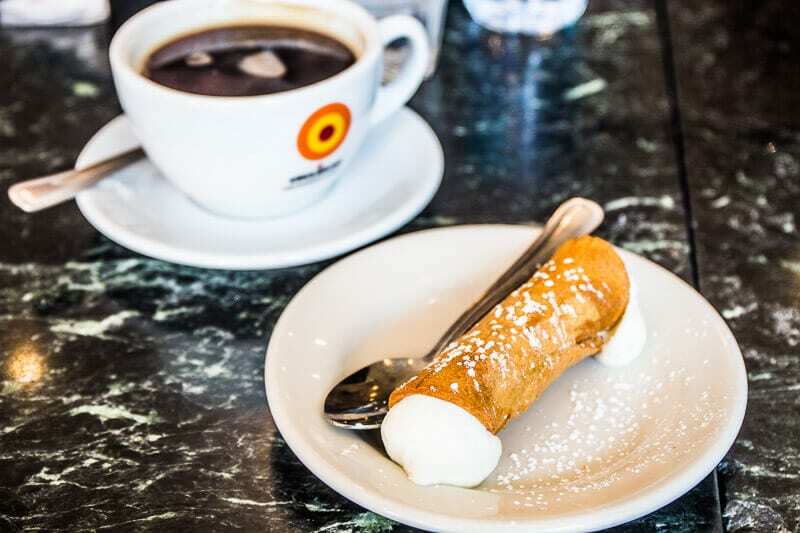 We stopped at Modern Pastry for our Italian coffee and cannoli. There are long lines for Mike’s Pastry, which is one of the most popular places for cannoli in the North End. But, Kate recommended Modern Pastry on this post on our site! 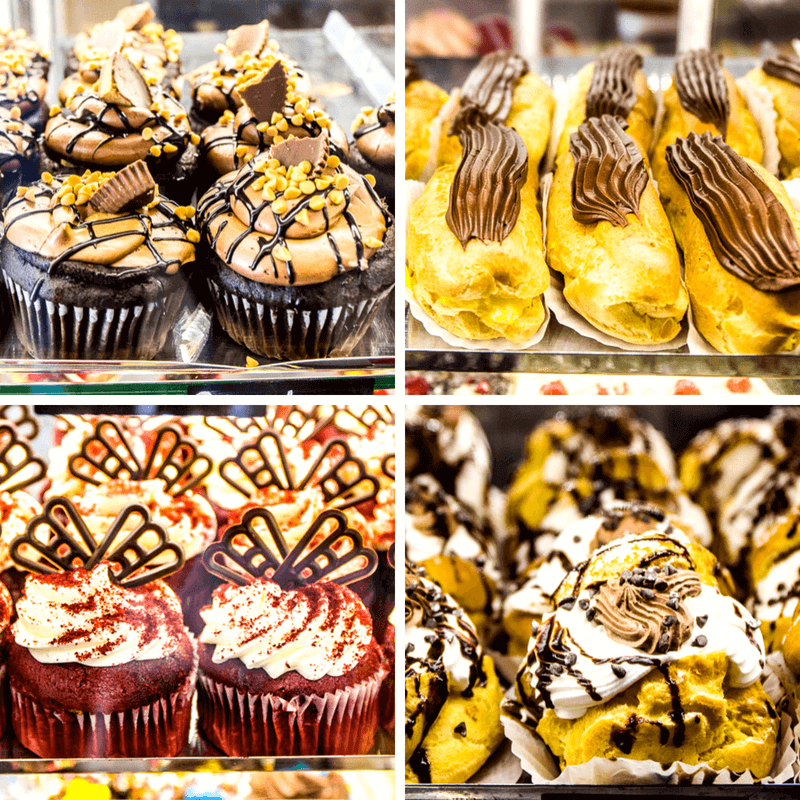 Their pastry cabinet is filled with delicious pastries and cakes of all types, so put this on your list of things to do with kids in Boston. You can order and go, or have table service. We chose to sit and rest for awhile. And we were thrilled they had gluten free cannoli’s, which were delicious with a rich, black Italian coffee. You know when you have a simple meal that you’ll remember for the rest of your life, not just for the taste, but for the moment it encapsulated. This Italian coffee and cannoli at Modern Pastry in the North End is that for me! 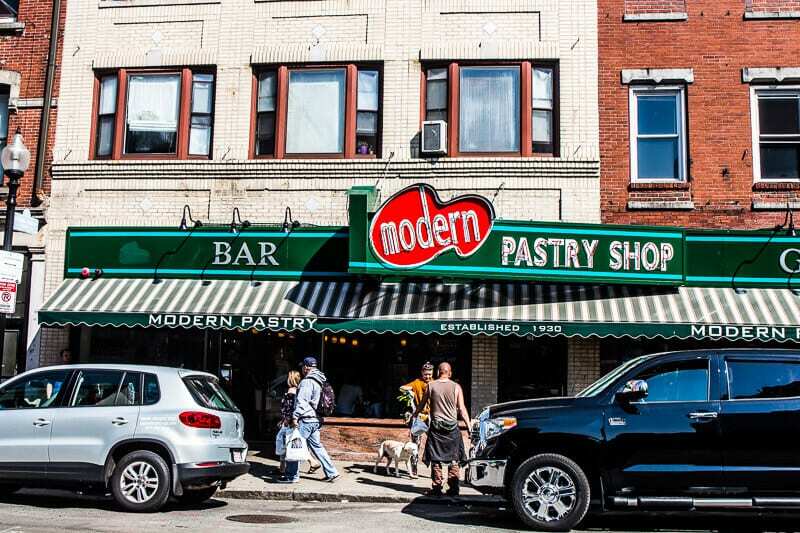 Check out these food walking tours of the North End. 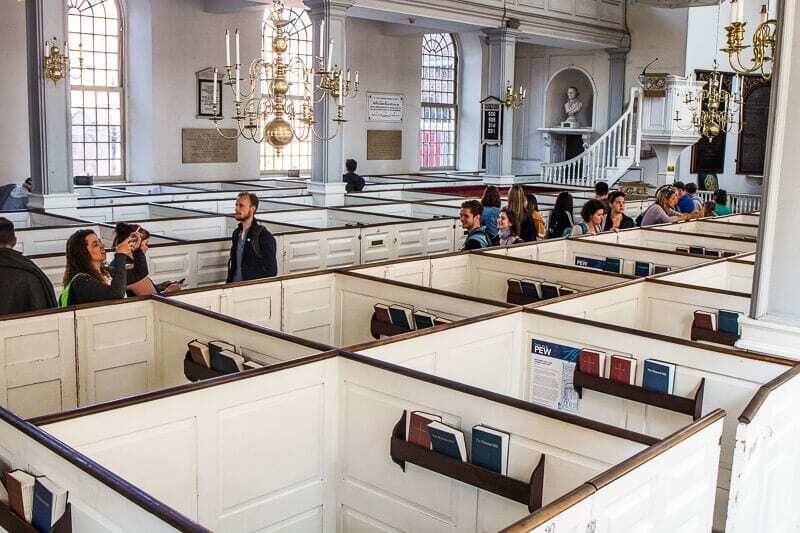 As we wandered past the Paul Revere Statue, stopping to pay our tributes to the man who helped save America from being captured by the British, we stumbled upon a church that had a flow of people people wandering inside. Well, just another church I thought. You tend to get blasé about them. But I could see Mum was interested so didn’t want to completely dismiss it. She had a peek in and decided it looked interesting enough to pay the suggested donation and have a look. It was unlike any church I have ever been in and upon entering we discovered its interesting American history story. On the evening of April 18, 1775, when the church sexton, Robert Newman, and Vestryman Capt. John Pulling, Jr. climbed the steeple and held high two lanterns as a signal from Paul Revere that the British were marching to Lexington and Concord by sea across the Charles River and not by land. The American Revolution began. The church is filled with white private cabined pews and is unlike any other church I have seen. Various pews have names and numbers on them which tell the story of different people who worshiped in the church. It also tells the true story of the Midnight Ride and how it was altered by Longfellow’s’ famous poem. Don’t you just love unexpected surprises like this when you travel? This is the reason we do it right? With our style of travel now in researching and planning and receiving tips from so many people round the world, we tend to not have so many of these surprises anymore. It thrills me when we do, even if it does happen to come from a building with a steeple. 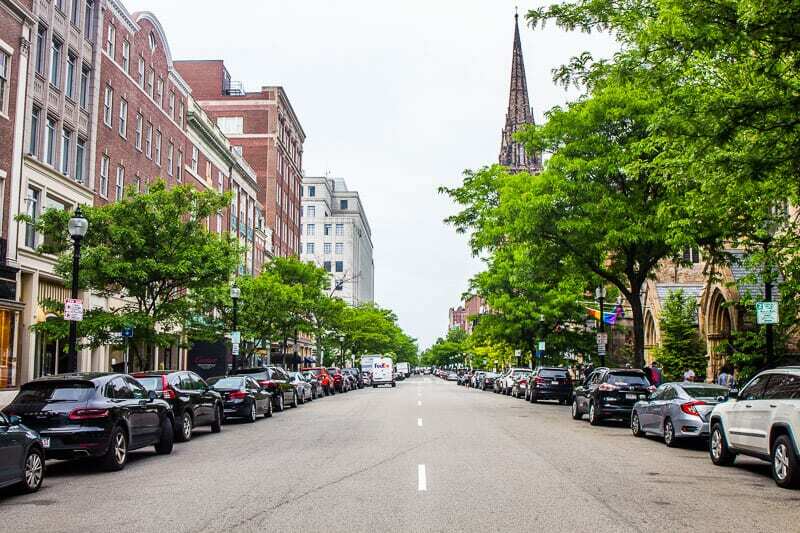 Looking for even more things to do in North End Boston? Paul Revere’s house is still standing, it is the oldest house in Boston and one of the most popular Boston attractions. It’s located in the North End and can be visited on a short tour. We decided just to look at it from the outside. After hearing more of the story over the next couple of days, I wished we had visited. We’ll make it one of our top things to do in Boston next time we visit. 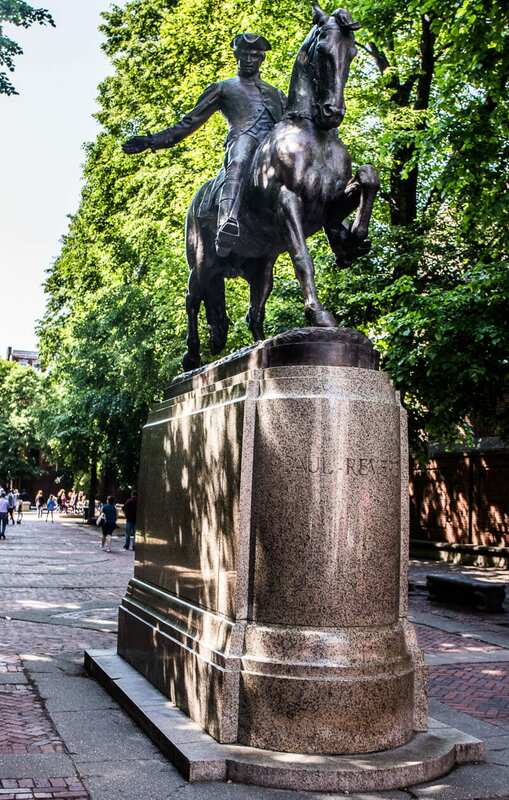 The Paul Revere House is part of the Freedom Trail and entry is also included on the Boston Go Card. A Bostonian local, who is a Raleigh friend of ours, basically said we’ll be doing ourselves a great disservice if we don’t eat at the Union Oyster House. I was concerned it might be one of those kitschy tourist traps, but it wasn’t at all. It has a story behind it that makes it interesting. And it possibly has had the most presidential customers. Jimmy Carter, Bill Clinton, George Bush Snr, and Obama apparently came in for a takeaway chowder. John F Kennedy was a frequent visitor, and even has his favorite booth dedicated to him. A future king of France, Louis Philippe, lived on the second floor. Exiled from his country, he earned his living by teaching French to many of Boston’s fashionable young ladies. Printer Isaiah Thomas published his newspaper “The Massachusetts Spy,” long known as the oldest newspaper in the United States, from the upper floor of the building in 117. Federal troops received their “war wages” in the official pay-station, which was right where we sat for lunch. It’s possible Washington himself sat there! And, the toothpick was first used in the United States at the Union Oyster House. Never mind the delicious food, the fascinating history is enough to want to dine here. 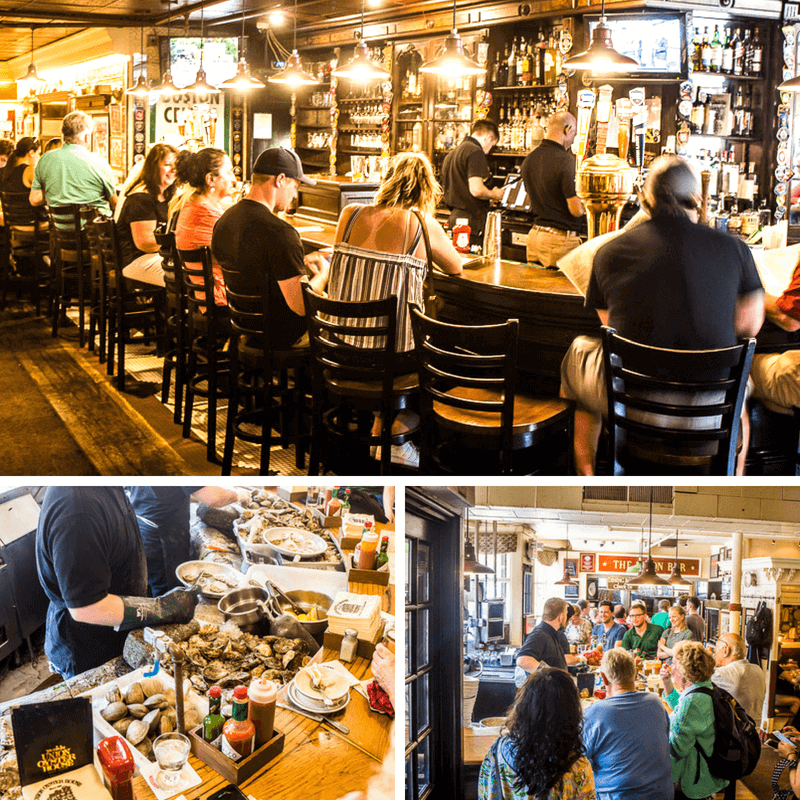 Pull up a seat at the famous semi circular oyster bar and enjoy a plate of fresh shucked oysters. 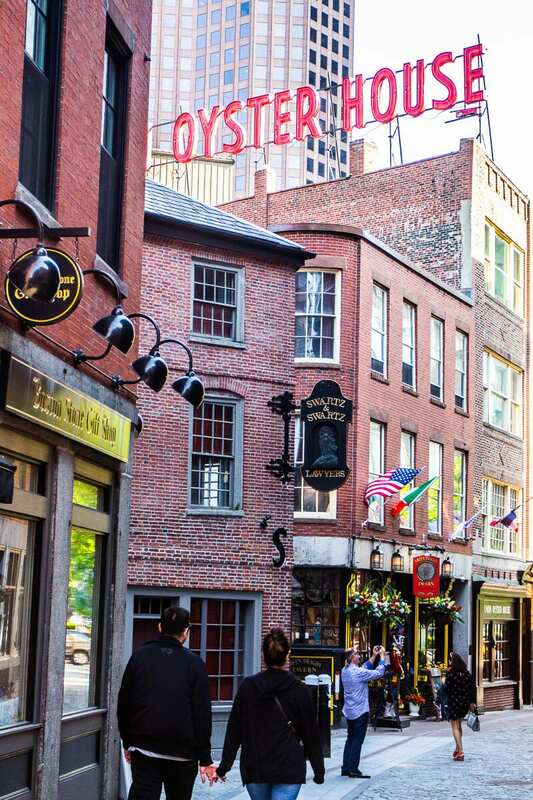 It’s in the most charming section of Boston, which is a triangle section of cobblestone streets and historic buildings, including the Bell in Hand Tavern across from it. 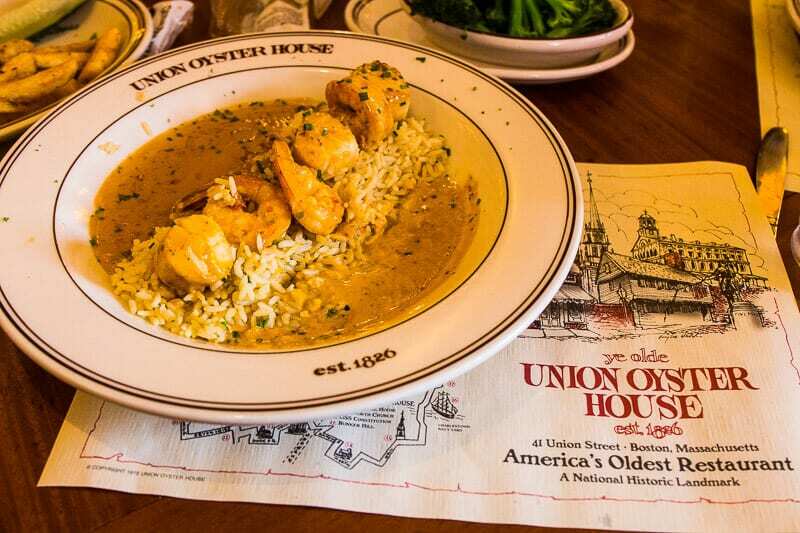 Read more reviews of Union Oyster House here. 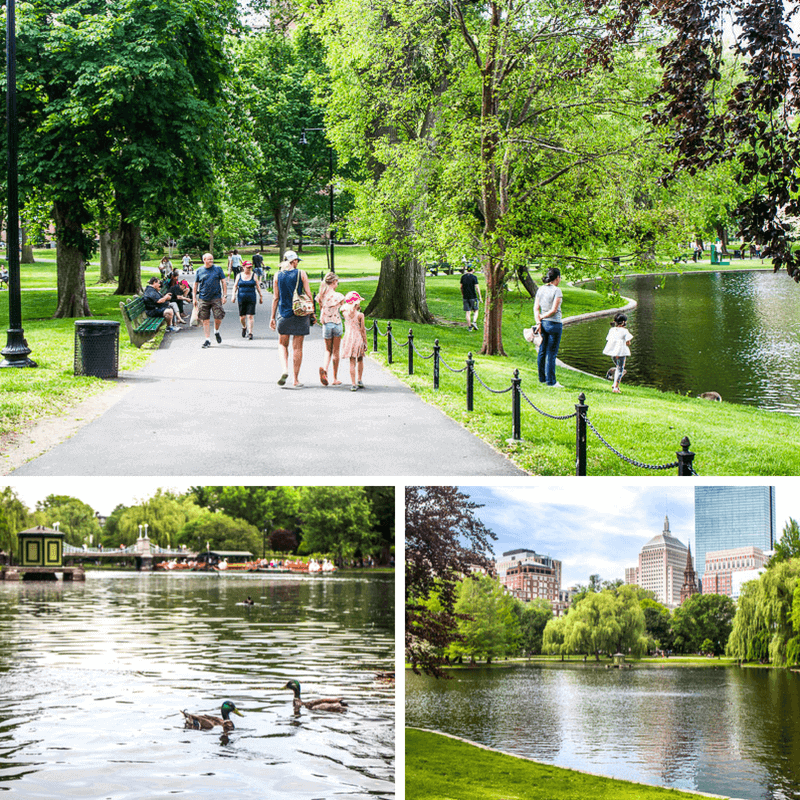 How beautiful is Boston Commons and the Boston Public Gardens which continues this sprawling urban green space? 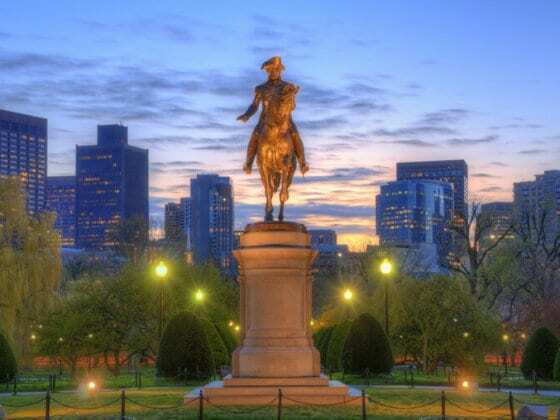 In 1634, Boston Common was created as America’s first public park. The 44 acres of Boston Commons was sold by the first settle of the area, William Blackstone for 30 pounds to the Puritan Colonists on the condition that it would always remain a free public space. A promise still kept today. No ticketed events are allowed here and it’s open to the public to wander, picnic, and take a break from the hectic Boston pace. Although, I don’t feel it’s too hectic to be honest. 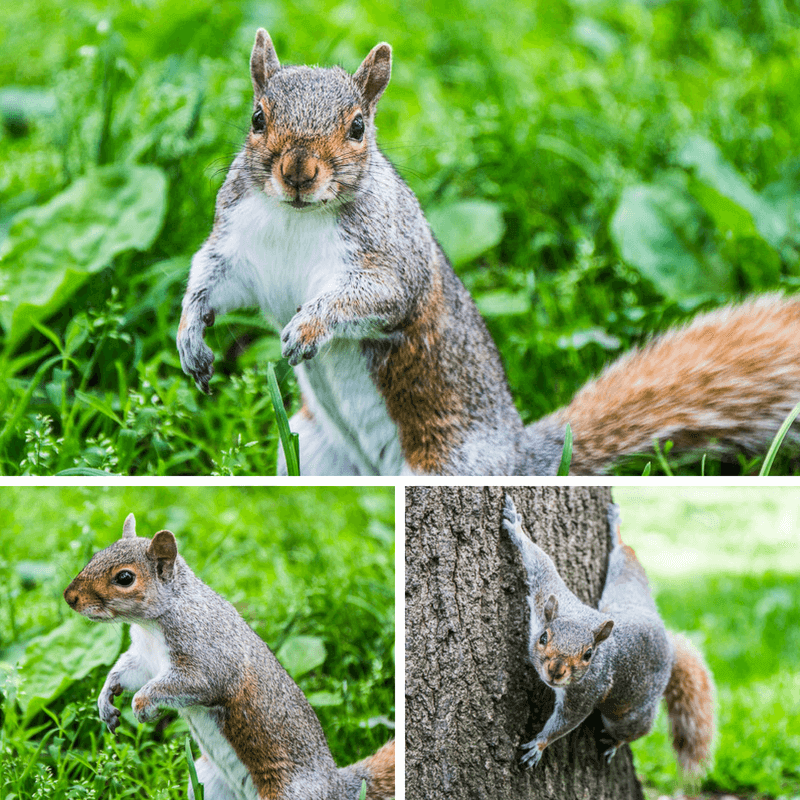 Even the squirrels love it here. The common land was used to graze local livestock until 1830. It was also a site for Puritanical punishments, home to a whipping post and stocks. 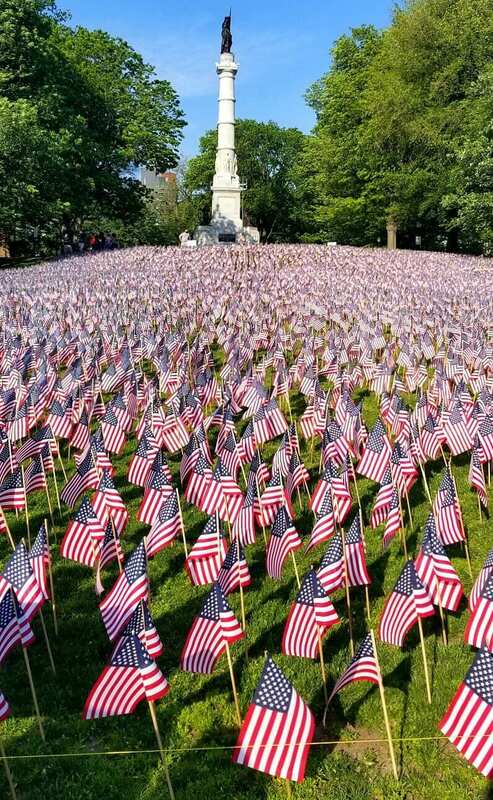 We visited during Memorial weekend and saw the touching Memorial Day Flag Garden where more than 37,000 flags are planted, each honoring a fallen hero from Massachusetts in wars from the American Revolution until today. 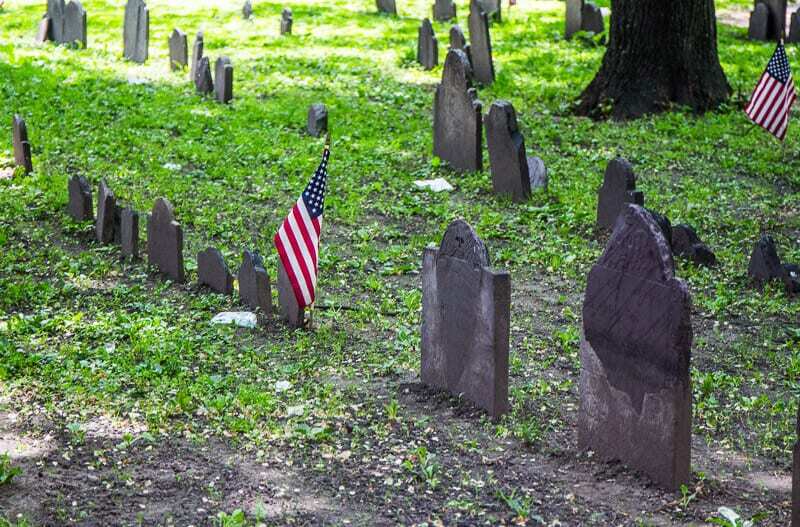 A must see in Boston on Memorial day. But way too many flags. Let’s work for peace please! As we walked out of the Union Oyster I glanced to the right and briefly saw a sign at the pub diagonally across saying something about the oldest tavern in America. I filed it away for another time. 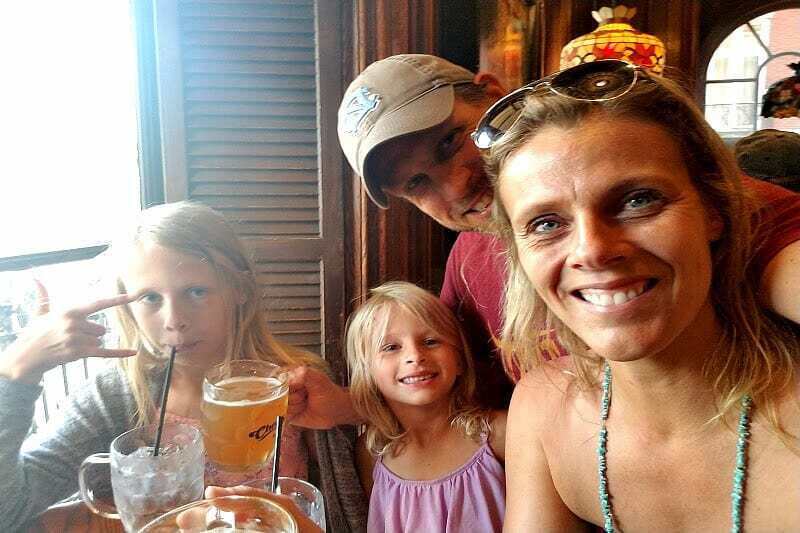 And when that time came after watching a Red Sox baseball game at Fenway Park when Mum and Dad took the girls and insisted Craig and I take a break and have a night on our own, The Bell in Hand Tavern sprang into my head. It had an English charm about it and made me miss my years of living in London. Our bar lady was super friendly, we chatted away to a couple visiting from Texas, AND it had the best cider I have ever had (more on that below) perfect for a hot summer’s night. The buffalo chicken nachos were pretty good too. In the back room they have live music. It was a little cramped and loud so we were happy to chill at the bar – kind of what happens when you get older. The Bell in Hand Tavern is the longest continuously operating tavern in the United States, having been built in 1795 by Boston’s retired Town Crier. 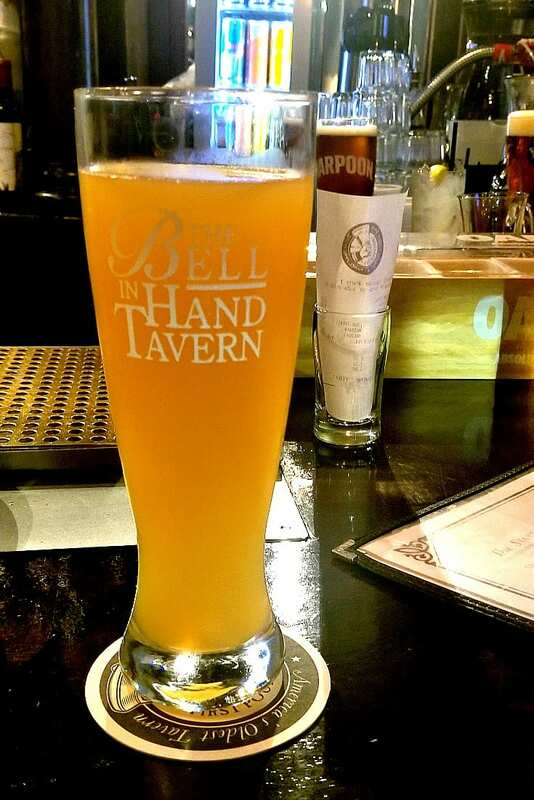 The Bell In Hand Tavern has always been known as the place where anyone is welcome, and everyone comes to drink, eat and enjoy lively conversations. It’s exactly what we experienced. Consider this for your list of things to do in Boston at night, or in the day. Looking for more free things to do in Boston? Across from the Boston Commons is the Boston Public Garden. 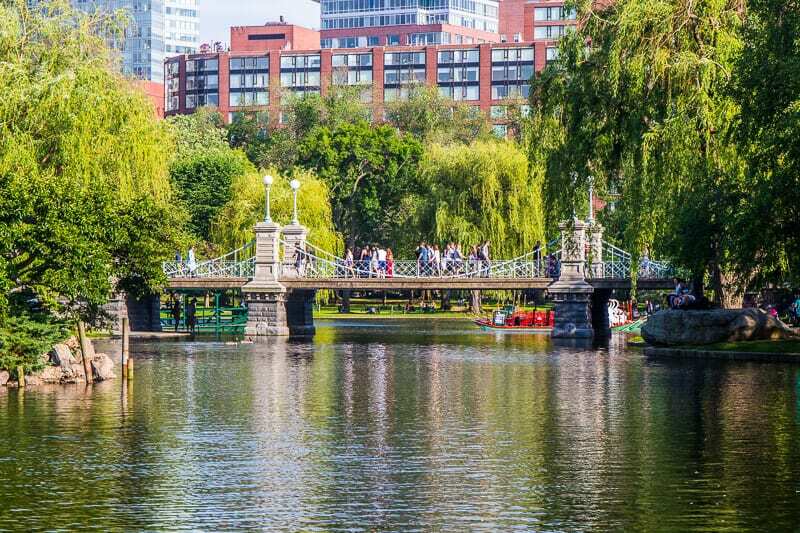 As the name suggests, it is probably a little more colorful and prettier than the Boston Commons with its lake, swan boat rides, and pretty gardens. This is also where you will find the George Washington Monument, one of the most photographed places in Boston. Boston Public Garden, established in 1837, was the first public botanical garden in America. 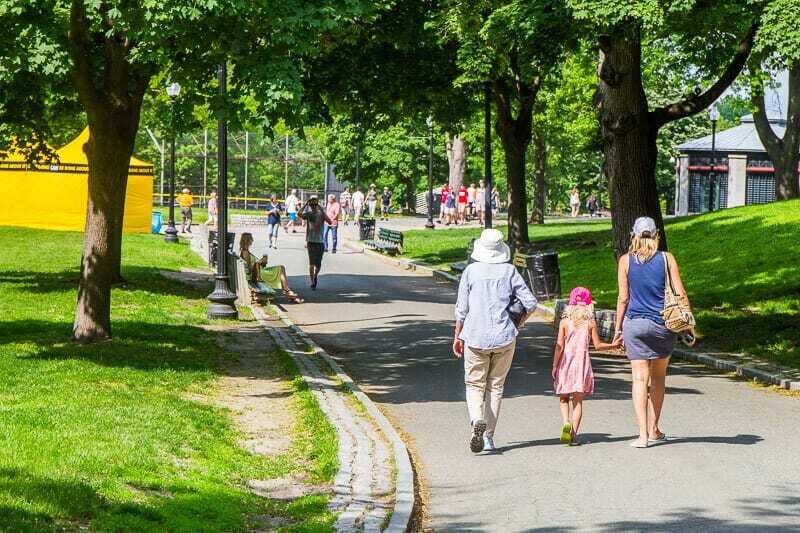 Whereas the Boston Common was practical and pastoral built for crosstown travel, the public garden was decorative and flowery and made for strolling along meandering pathways. 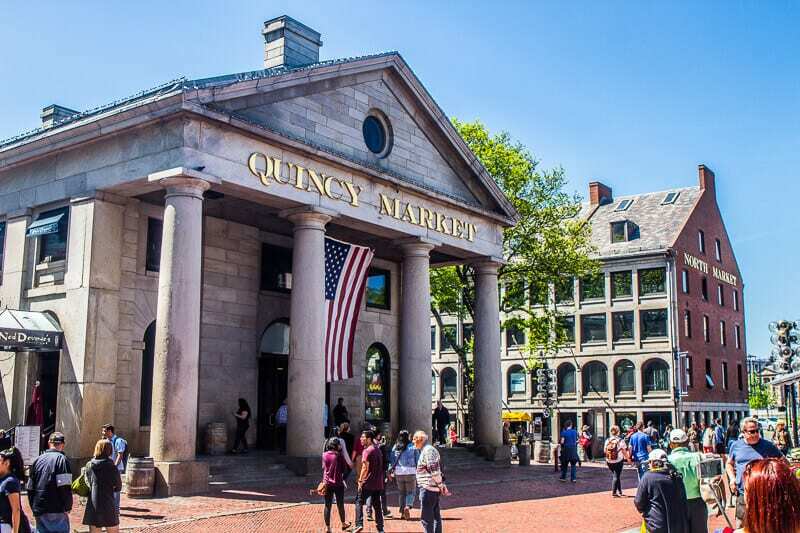 Faneuil Hall Marketplace is another one of the Boston historic sites in the center of the historical area in downtown and is a fabulous meeting point. It also has a lot of history. Surrounding it are various markets and, like most tourist areas, it’s here where you’ll find a lot of street performers and overpriced shopping and food. We actually didn’t find it too bad, and I picked up a beautiful handbag from a Turkish store. Looking for places to eat in Boston? 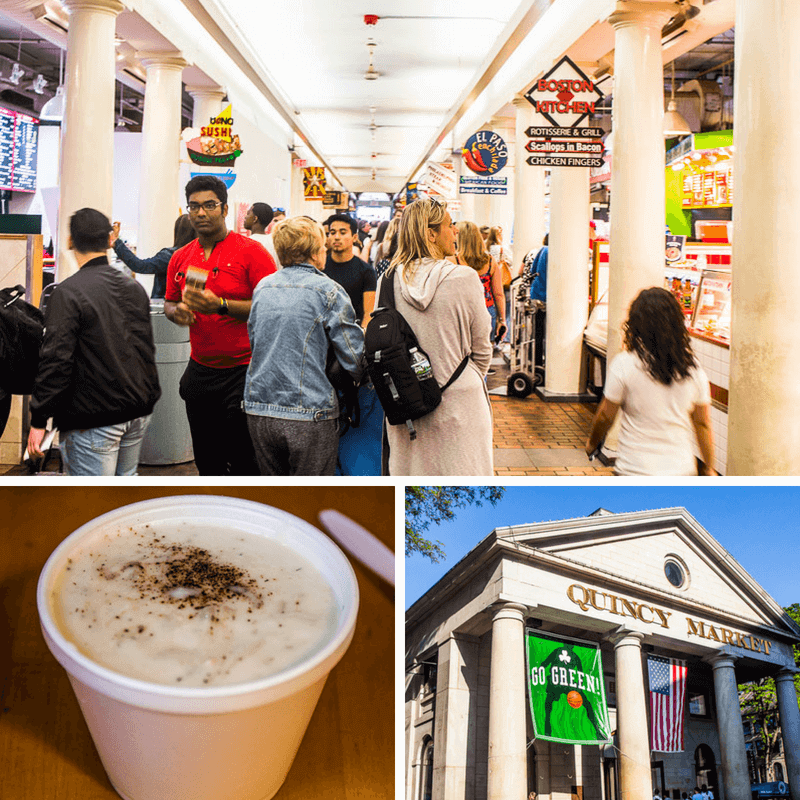 The Quincy Market has loads of food stalls for you to choose from. We were very happy as within Quincy Market we found gluten free Boston Chowder. Now that is difficult to find and we finally were able to sample one of Boston’s most famous dishes. 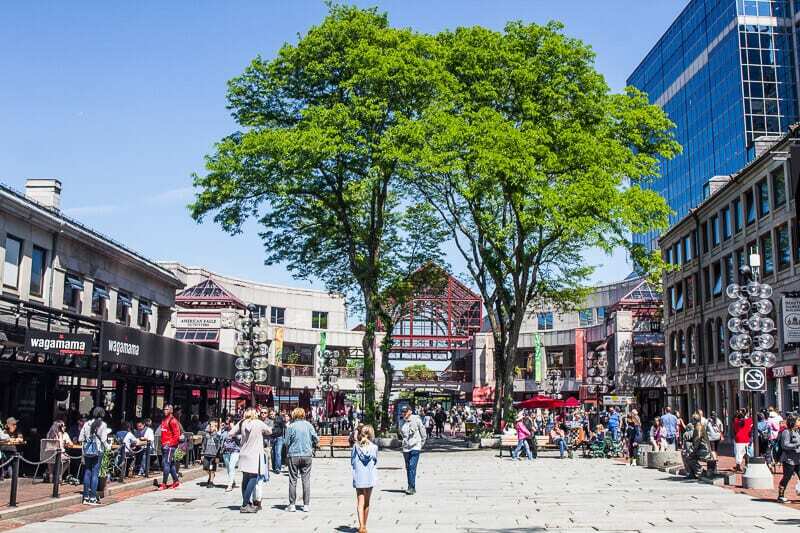 Check out these hotels near Faneuil Hall. I think it took my Mum and I awhile to speak after we started walking down Newbury Street. Each of us silently taking in how beautiful it was. It’s not like any other high end shopping street you have walked along before. 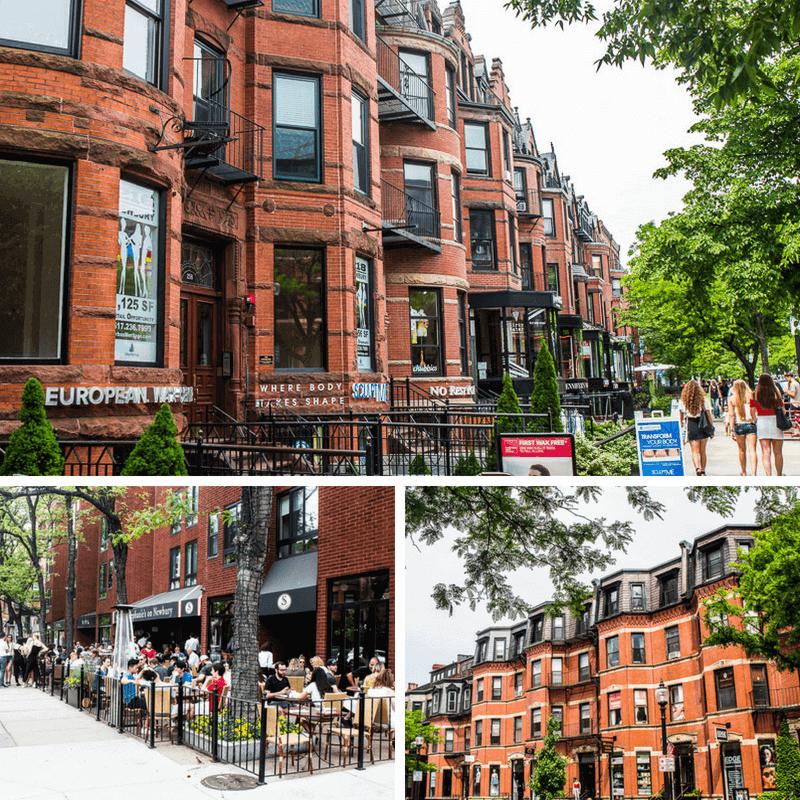 I’ve been to some of the most well known, Rodeo Drive in Beverly Hills, 5th Avenue New York, Magnificent Mile in Chicago, I love all of them, but Newbury Street is something special. Inside rows of terraced houses are not families going about their day but boutique dress stores, jewelry stores, cafes and restaurants. Once again, I recognize the space due to a lack of high rises. It’s colorful and gentle moving. I was so glad we decided to walk from Boston Gardens and along Newbury Street to Fenway Park for our Red Sox baseball game. It took us longer than 30 minutes as we stopped to look at stores, take in the views of historical and magnificent churches, and drop in for a coffee in the sunken front courtyard of Barrington Coffee Roasters. Coffees here are good peeps. Having the name roastery in a café name is often a good sign it will be. Not only do you get this iconic baseball song in the oldest baseball stadium in America, you also experience a very unique sing a long. It made me fall in love with baseball and the Red Sox because of their acknowledgement and honoring of my soul. Yes, at the bottom of the eight innings, the stadium an the crowd breaks into the most truthful song in the world, Sweet Caroline!! My parents were stoked that they sang that song especially for me, lol. We had a great time watching the Red Sox beat Atlanta at Fenway Park. 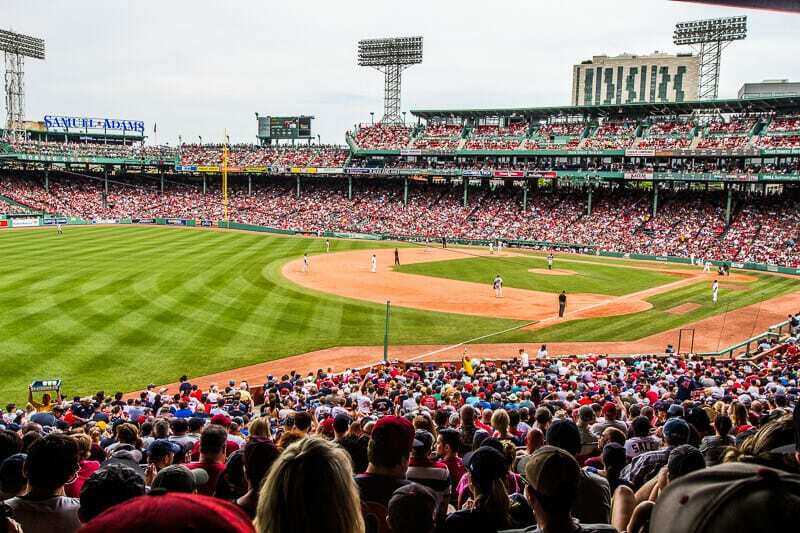 It truly is one of the most iconic places to watch baseball in the US and one of the cool things to do in Boston MA. Don’t miss it! These are the cultural experiences we travel for. 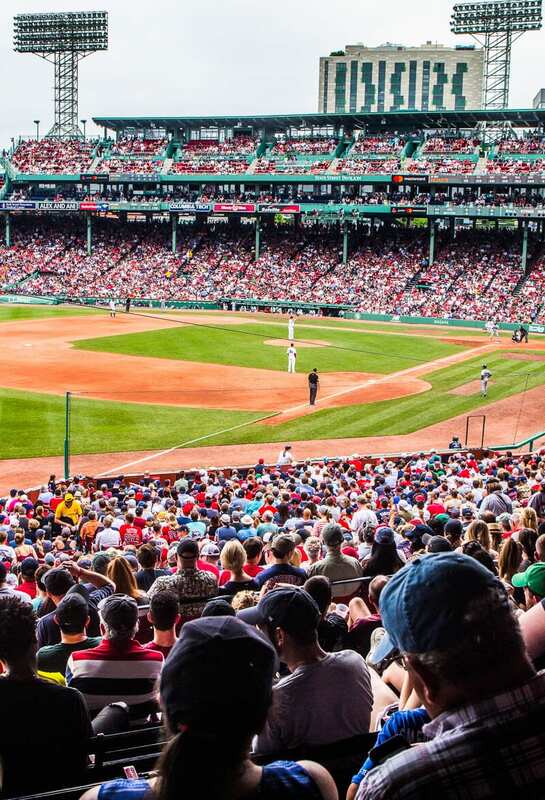 Fenway Park is a small baseball field and its legendary for its green monster, which is basically a giant green fence that the baseball players love to hit home runs over. We saw a couple happen during the game. You couldn’t have a bad seat in the house. We sat just behind left field and had perfect views. It’s a really fun event and one of the most iconic places to go in Boston! 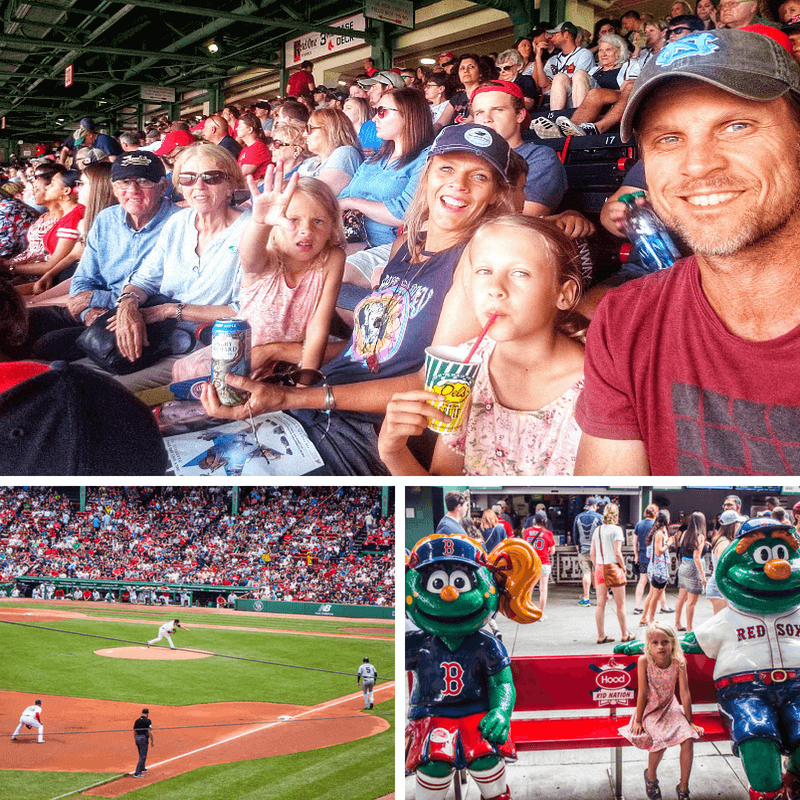 You can read more in this post about our experience at Boston Fenway Park. 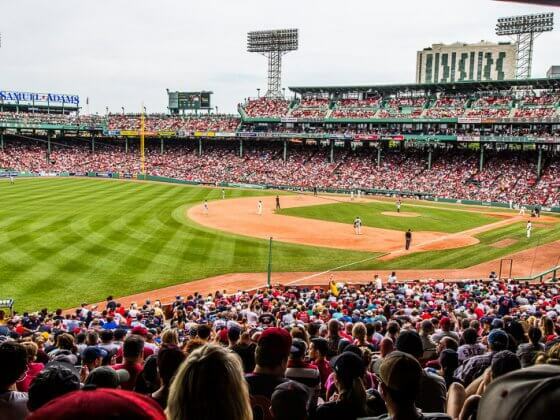 If you can’t catch a game, you can also take tours of Fenway Park. Tickets to a Red Sox game are also included on the premium version of the Boston Go Card. Looking for fun things to do in Boston with kids? Do this. We’ve been on a few duck tours and always enjoy them, but the Boston Duck Tour has been the best one yet. There’s just something about this city, even their amphibious vehicles rock. Our guide Betty, was hilarious. I enjoyed her passion for the city and her stories were entertaining, informative and insightful. And her jokes weren’t too cheesy like some duck tour guides can do. 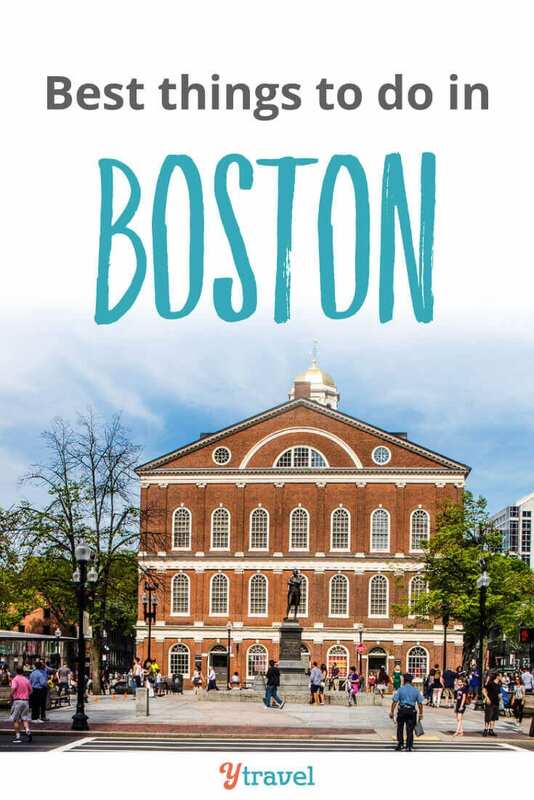 The tour goes for 80 minutes and drives around to the most important and historical Boston tourist attractions and neighborhoods. 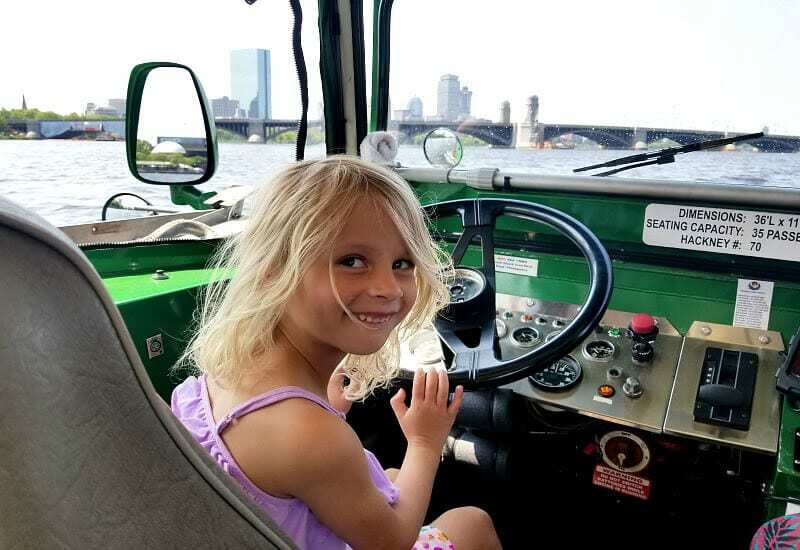 The tour includes 20 minutes of cruising down the Charles River with views of Boston and Cambridge skylines. Savannah welcomed the opportunity to be the Captain of the boat and steer it for little. Tell your child to not be shy in volunteering. 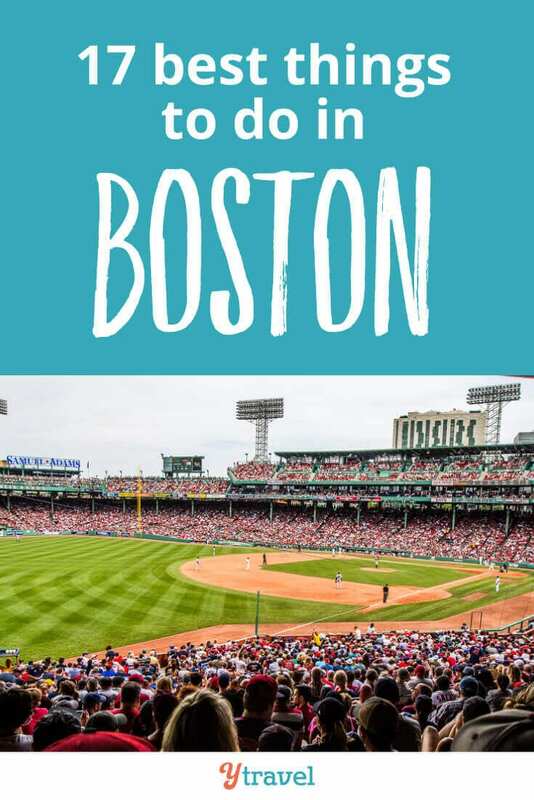 We got off the Duck with a much longer list of things to do in Boston after discovering one or two more places we wanted to go back and explore more. These kind of city overview tours are so great to do at the beginning of your trip, not just for the stories and historical insights, but also to discover places of interest. We certainly had a time constraint in doing so but we managed to rearrange a few things to fit in a few more attractions. You can purchase your Duck tour tickets with our partner, Viator. The Boston Duck Tour is also part of the premium Boston Go Card. 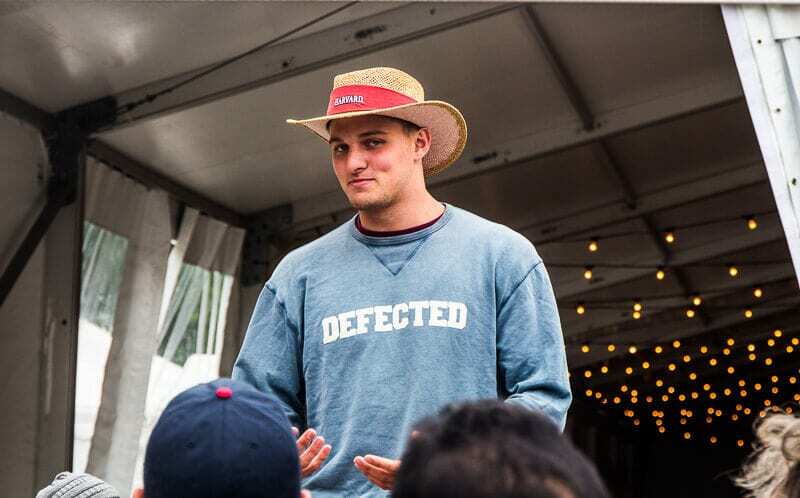 Even though when we joined the Harvard walking tour led by students we could not access the Harvard Yard – the draw card of the experience – due to a private event, I absolutely loved the Hahvahd Walking Tour. And I would do it again even if it meant still missing the Yard. It was awesome to gain an insight into life in one of the most prestigious colleges in the world. From our guide Tim we learned the history of Harvard, the culture of Harvard and what incredibly inspiring, well rounded individuals it helps produce. 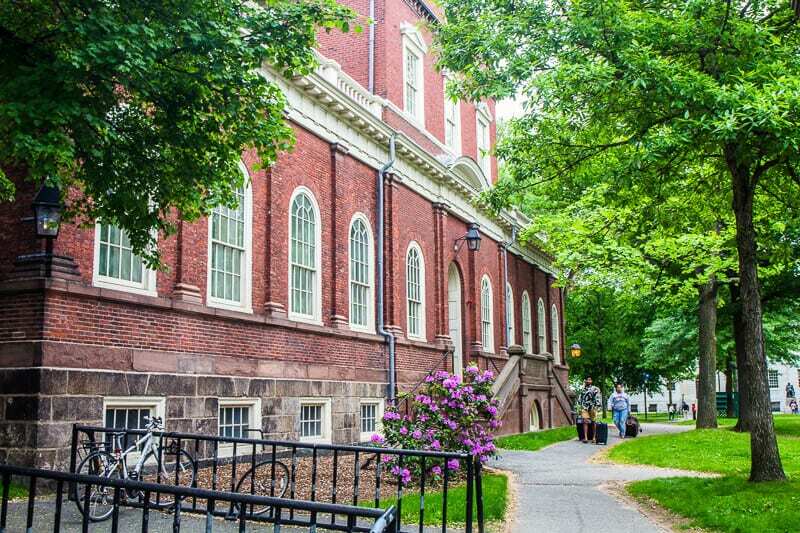 I love their style and philosophy and I am sure no matter what you graduated with, a degree from Harvard would open up many doors just because the education and how it raised fine young adults. I’d be delighted if my girls went to Harvard. It has certainty go them thinking about college. You know something is good if you buy an item of clothing as a souvenir. My Mum went straight to the gift shop to buy her self a gorgeous sweater. She also bought one for me. Perhaps she feels it’s not too late for her daughter to go to Harvard? Or maybe even herself. It’s never too late Mum. As long as I can come visit you! Purchase your Hahvahd Walking Tour here. The Harvard Walking tour is included in the Go Boston Card. If you go on the Duck your, keep your tickets as you can use them to get a free Harvard walking tour, or 50% off on the weekend. Click here to read more about the Harvard Walking tour. Back Bay is the oldest neighborhood in Boston and situated on the Boston Common. You know its part of the original Boston as it’s hilly. Any flat piece of land in Boston is landfill. It was once much smaller than what it is. 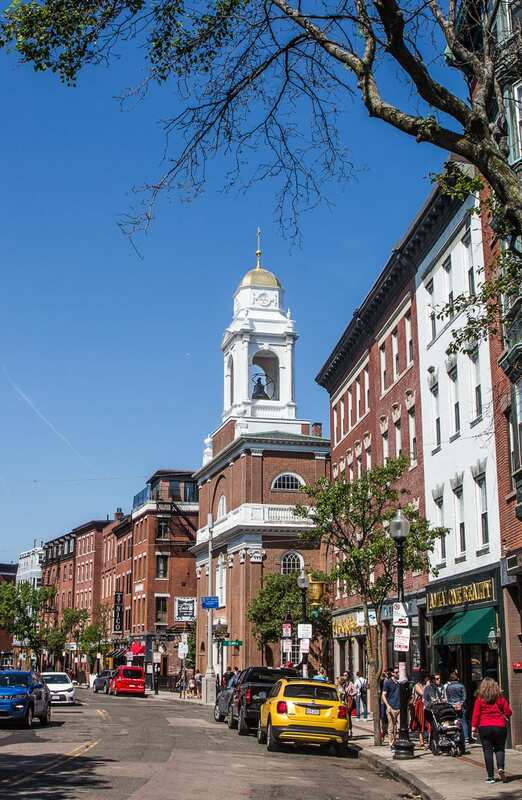 Back Bay is where you’ll find cobblestone streets and residential terraced homes. Duck down some of these streets and you’ll find serenity – it’s surprising the lack of cars and people wandering around. Head out onto the main street however, Charles St, and you’ll find boutique stores, cafes, restaurants and plenty of people. One of the most unique places in Boston to visit. On our Duck tour, we learned about the Liberty Hotel, which used to be a former prison, Charles Street Jail, a national historic landmark and architectural gem built in 1851. As we were wandering around Beacon Hill we decided to pop in and have a look. It’s worth it. It’s certainly not what you’d expect a prison to look like. It has now been imaginatively restored into a five star hotel complete with restaurant, The Clink. 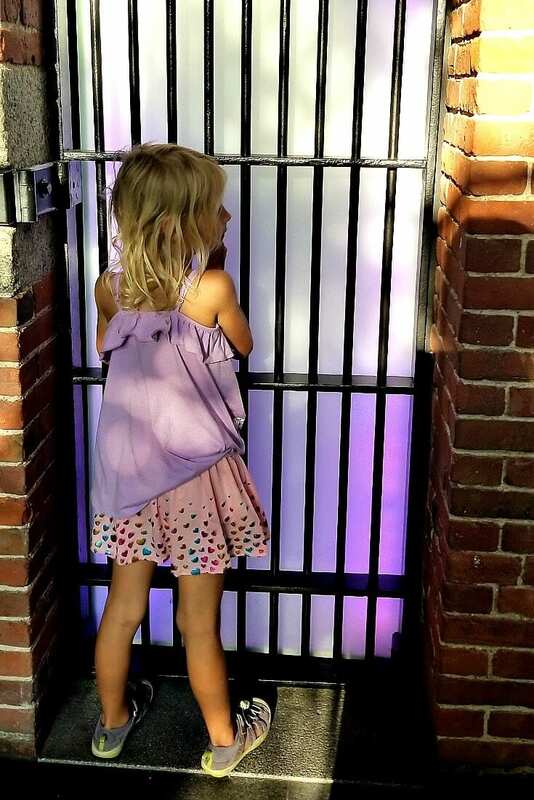 The Catwalk is a hotel-guest only retreat that is on the original Charles Street Jail catwalk, and the former exercise yard, which is now a private, beautifully landscaped courtyard. Don’t miss the Alibi bar, set in the old “drunk tank” for a drink either inside the brick cell walls or the outside patio. Look at the posters on the walls of celebrities who have been arrested and what their alibis were. It’s hilarious and will be one of the things to do in Boston you’ll be telling people about when you get home. We’d love to stay at the Liberty Hotel in Boston on our next visit. As it’s a luxury five star hotel, the girls are demanding it! 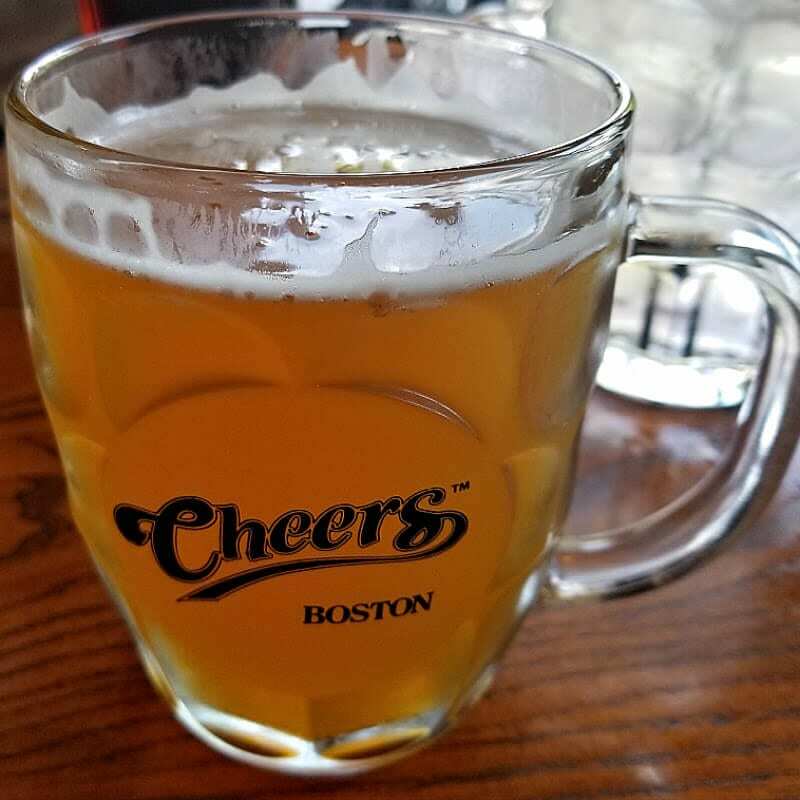 There is no real Cheers bar in Boston, however, there is the pub that inspired the massively popular TV show. The Bull & Finch Pub as it was previously known was founded in 1969 in Beacon Hill and became the inspiration for the setting of the Cheers bar, as it was in an area that was famous for colorful pubs, sports teams and lively politics. The exact recipe you need for interesting pub conversation right? The Bull & Finch Pub is now known as the Cheers Pub. 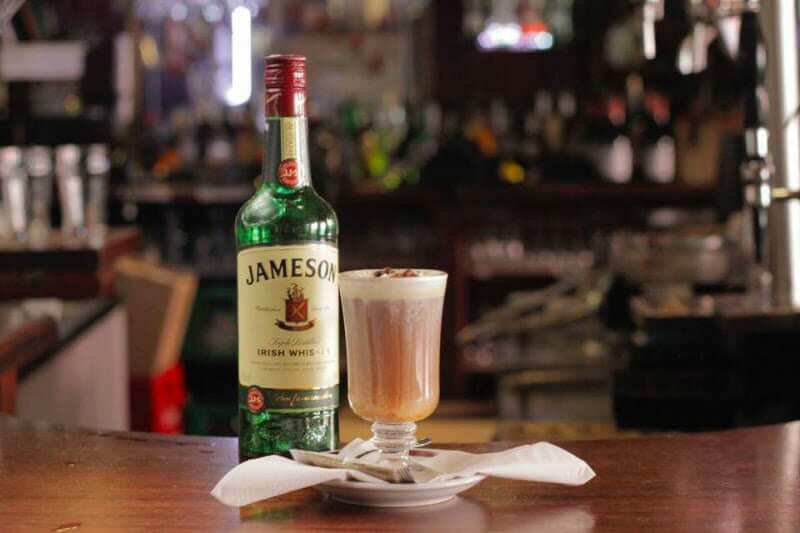 It’s a great neighborhood bar, albeit now a little bigger, and is across the road from the Boston Public Gardens. 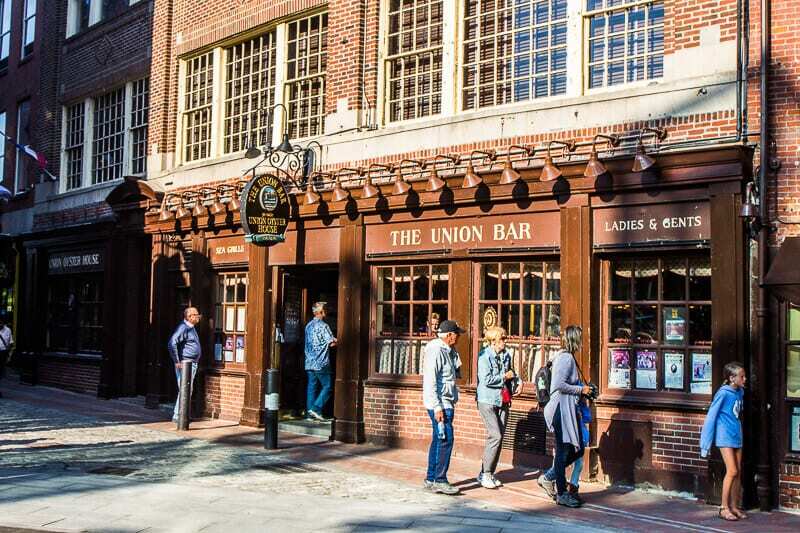 Pull up a seat at the bar if you can find one, or a seat at the window for views over your pint – one of those “touristy” places to visit in Boston. 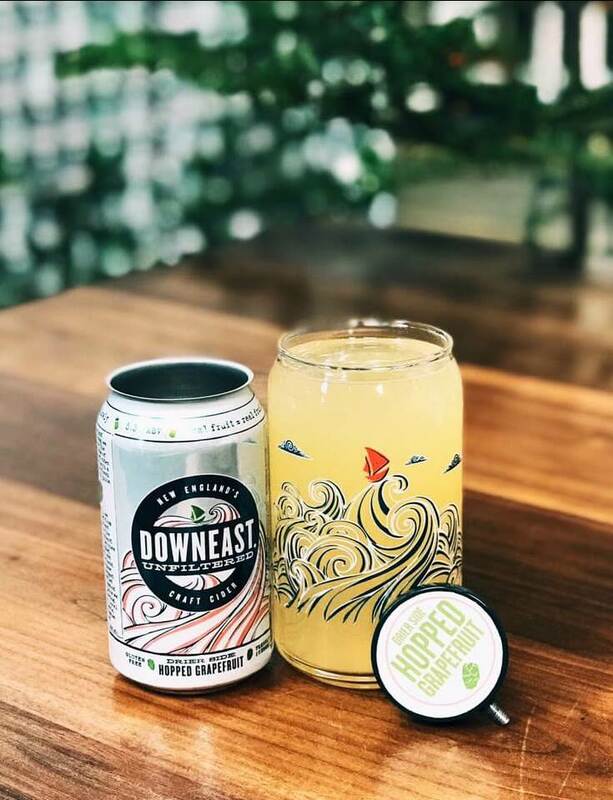 Okay, so we didn’t visit the Downeast Cider House, but I am recommending it as one of the best things to do in Boston, especially if you are gluten free and love cider. 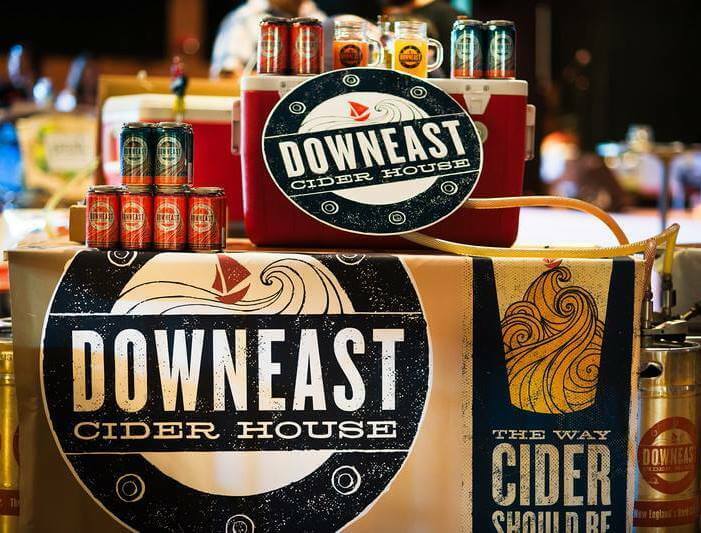 Downeast Cider is the best cider I have ever tasted. It’s a local Boston craft cider house founded by some college friends in 2011. We had a pint of it first at the Cheers Bar, and then several at the Bell in Hand Tavern. It was quite citrusy in flavor and the closest to my favorite wheat style beer that I can no longer drink. I’m currently trying to remember which cider it was so I can order some cases to be sent to me in Raleigh. Another couple of things I loved after checking out their website. They are committed to taking no shortcuts by using only fresh pressed juices and nature ingredients. No wonder it was so bloody good. And, on their website, they let you know they pay their employees well so no need to tip. I am on the hunt for more places like this in America to recommend to you! The Cider House is located in East Boston and they do tours of the cider house with complimentary samples and flights of cider. Look out for their ciders in the Boston bars as well. See more about their cider house tours here. I’ve just loved reliving our time in Boston writing this post. It’s a unique and fun city and I understand why so many people rave about Boston. I am sure there are many more must not miss things to do in Boston. Sadly our time was too short to do them all. Please let us know in the comments what your favorite things to do in Boston are so we won’t miss them on our next visit. 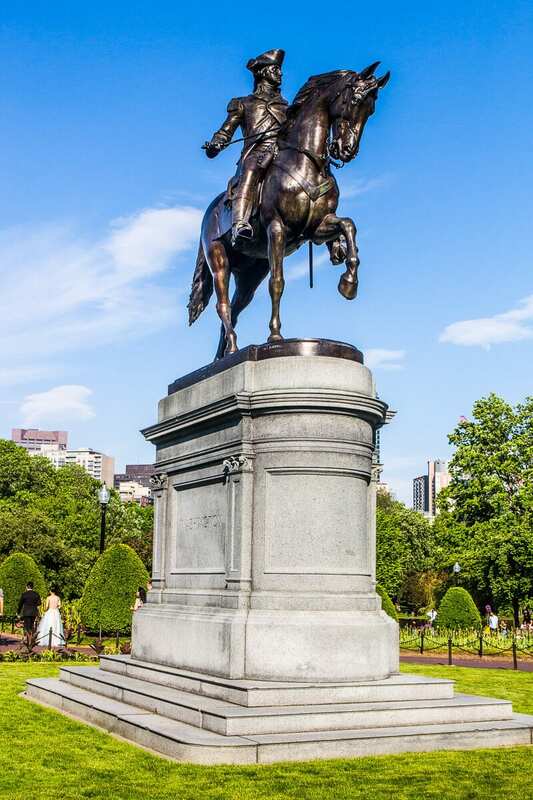 Go Boston Card helps you visit multiple Boston attractions for one low price. Save up to 55% on top museums, tours, and activities, and pay nothing at the gate. Some Boston attractions include the Boston Museum of Fine Arts, New England Aquarium, Isabella Stewart Gardner Museum, and Boston harbor cruises. Get your pass here. It was challenging to find accommodation in Boston that wasn’t hugely expensive. 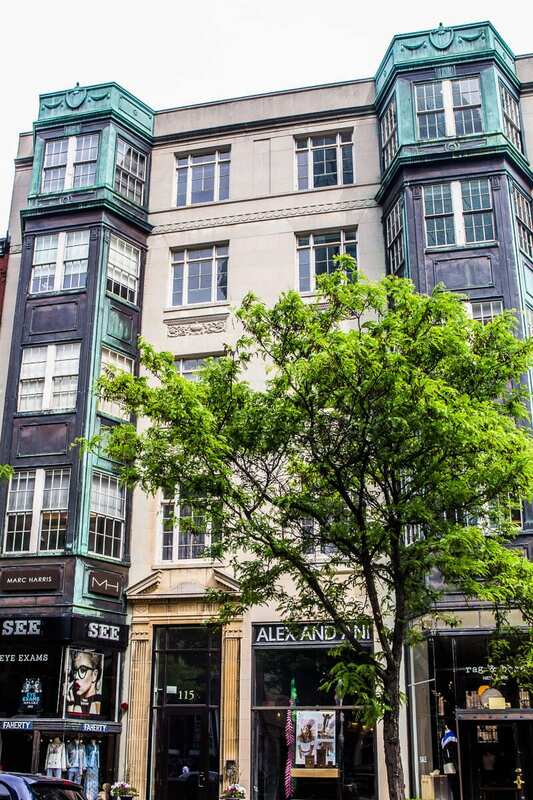 Boston is said to have the most expensive accommodation in the country! There goes those superlatives again. And we visited over Memorial Weekend, one of the busiest weekends in the year. Airbnb was not giving me anything too inspiring. Then I remembered that Booking.com have apartment rentals and I found a great deal on a brand new apartment in the South End, not far from the Seaport District. 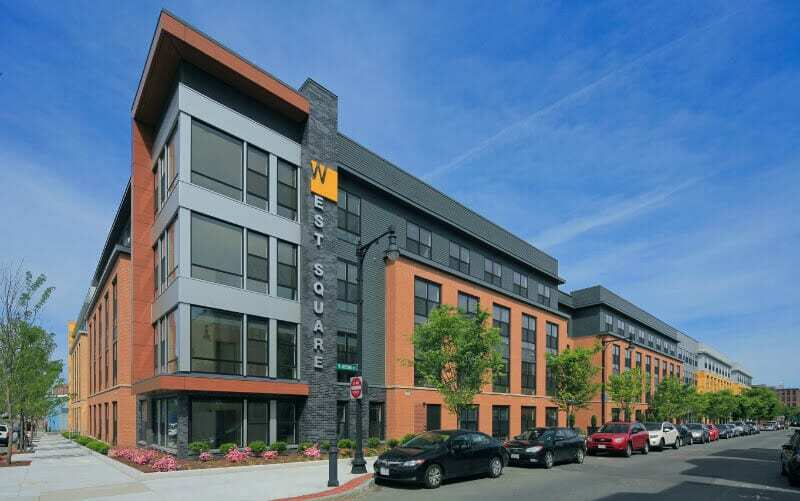 The South Boston Family Getaway at West Square Apartments was about a 40 minute walk into the city or a quick and relatively cheap Lyft ride to downtown or anywhere really. It was spacious and comfortable and so modern with beautiful décor. There were two bedrooms and a sofa bed. One of the beds was a King so we could throw one parent in the King with the girls and the other on the sofa bed. We like to do it that way so the girls can go into the room and sleep while us oldies relax with a bit of TV. We got a little hooked on the Netflix show Turn while on our road trip, which is all about patriot spies during the War of Independence. Perfect to watch when you’re in a city like Boston! 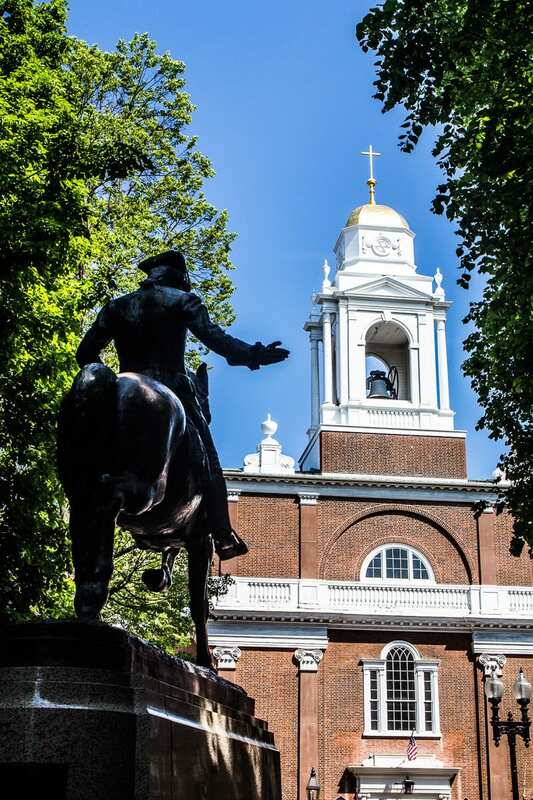 What to do in Boston – a locals perspective. Check out the fun we had in Boston. Accommodation: Book hotels and apartments in Boston directly on Booking.com, or read hotel reviews for Boston on Trip Advisor. 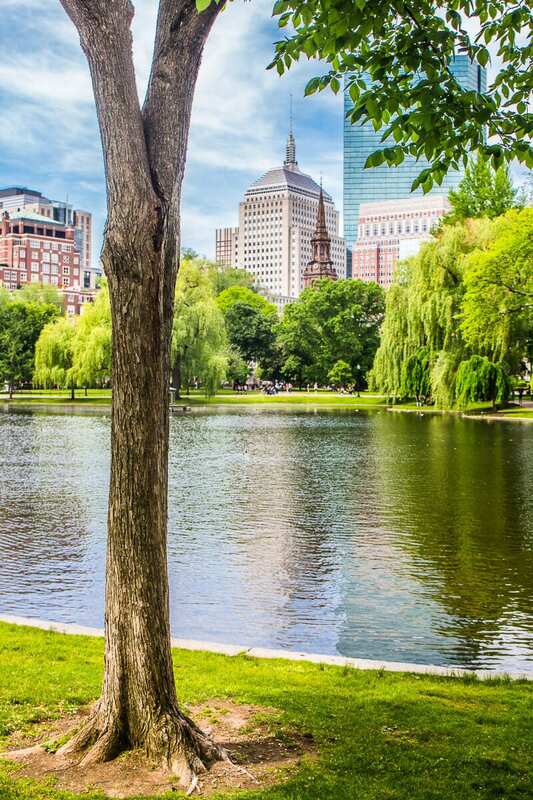 Tours: Viator is a Trip Advisor company and offers small group tours to popular Boston attractions. Do you have any tips or questions about the top things to do in Boston MA? Share in the comments! The kids must’ve been so happy about the pastries! The pastries were SO GOOD! Great tips! 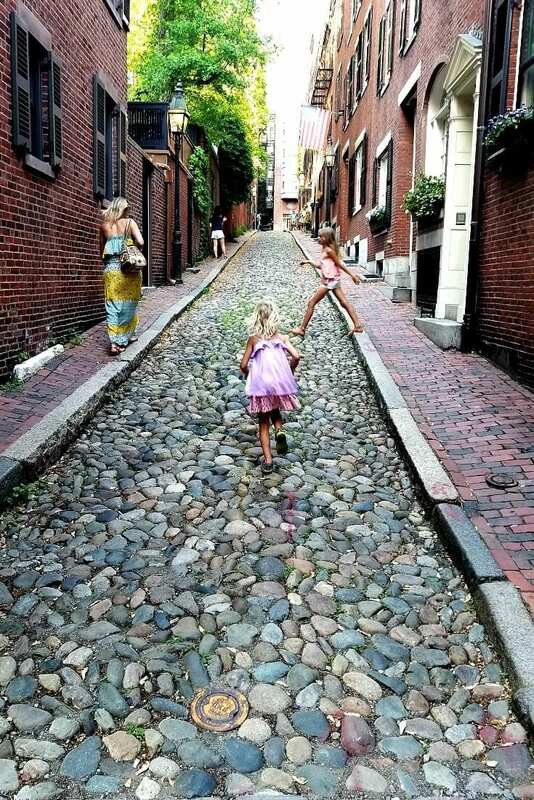 I’ve been to Boston a couple of times on my own but need to get there with the kids! 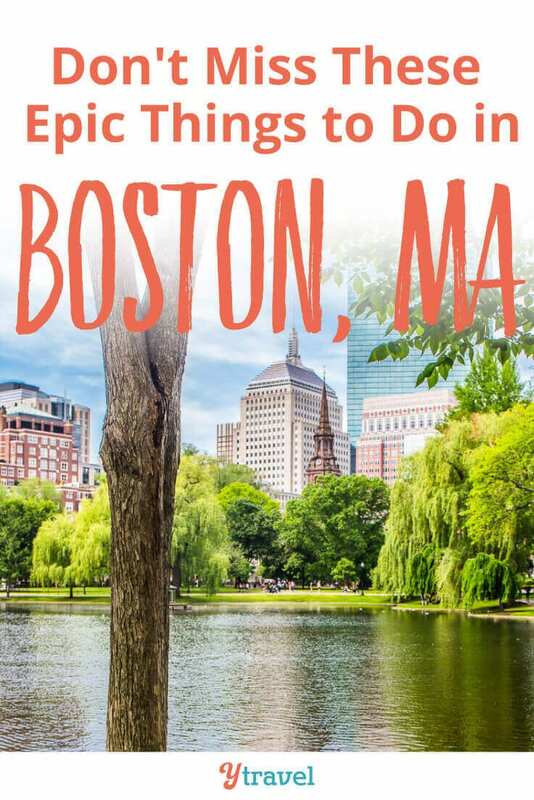 Yep, lots of things to do in Boston with the kids, and without as mentioned. Wow, I lived outside Boston for a few years and didn’t do all of this. But this will be a great list for when I visit with my kids. Thanks! Glad you found it useful Carie. 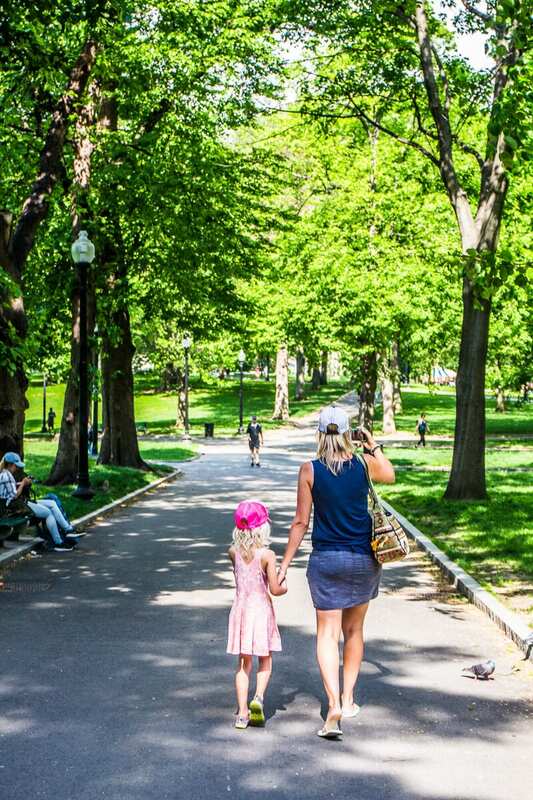 Plenty of interesting and fun things to do in Boston with kids!